Native to Europe, Asia, and northern Africa. Introduced as an ornamental shrub, escaped cultivation, and naturalized in North America. Wet to dry. Forests, thickets, hedgerows, pastures. Full sun to partial shade. This is usually a tall shrub, sometimes a small tree. It rises from a woody taproot on 1 or a few stems. It is moderately fast-growing, short-lived, 16′ to 25′ tall, and up to 5″ in diameter at breast height. The bark on young stems is smooth, thin, shiny, gray to reddish-brown, with numerous prominent, elongated lenticels. On older stems the bark is dark gray and scaly or peeling with curly edges, revealing orange inner bark. 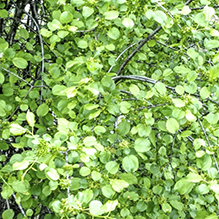 First-year twigs are slender, stiff, green to brownish-green, and hairless. 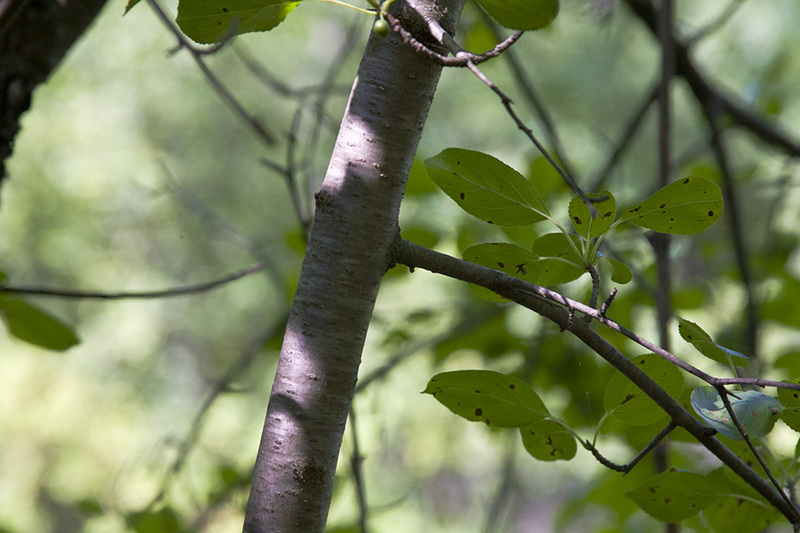 Second-year twigs are brown with a gray, flaky outer layer. There is a thorn at the tip of many of the the twigs, giving this plant its common name. There are additional dwarf spur branches with a thorn at the tip. The thorns are between the last pair of lateral buds. Buds are about ¼″ long, egg-shaped, sharply pointed, reddish-brown to dark brown, opposite or almost opposite, and appressed to the twig. They are covered with a few distinctly overlapping scales. The scales have a margin of fuzzy hairs. The leaf scars are small, crescent-shaped, distinctly raised, and have 3 bundle scars. 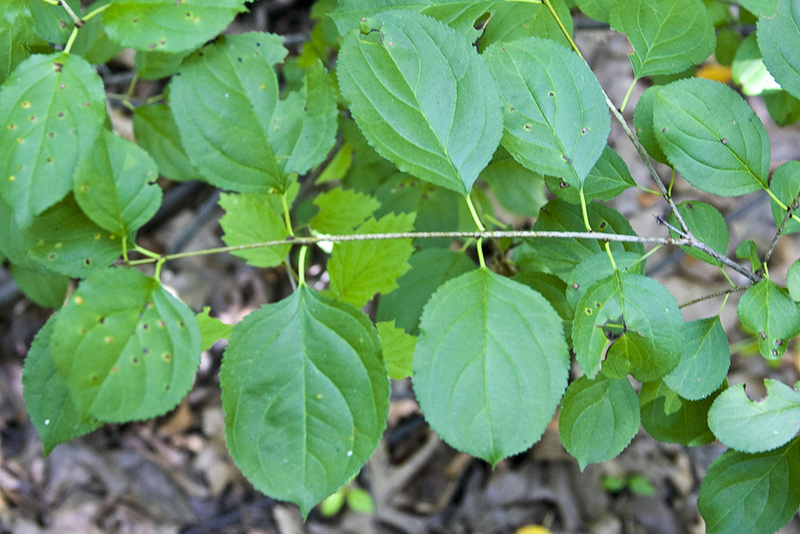 The leaves are deciduous and usually opposite or almost opposite, sometimes alternate. They are on hairy, ⅜″ to 1⅜″ long leaf stalks that are grooved on the upper side. The leaf blades are inversely egg-shaped to elliptical, 1½″ to 2⅜″ long, and ¾″ to 1½″ wide. They are rounded or tapered at the base and usually abruptly pointed, sometimes rounded, at the tip. There are 3 to 5 lateral veins on each side of the midrib. The veins are strongly curved, arching toward the tip. They are depressed on the upper side of the leaf and stand out on the underside. The upper surface of the leaf blade is medium green to dark green and hairless or nearly hairless. The lower surface is somewhat pale green and hairy or nearly hairless. The margins are finely toothed. The leaves stay green into late fall. 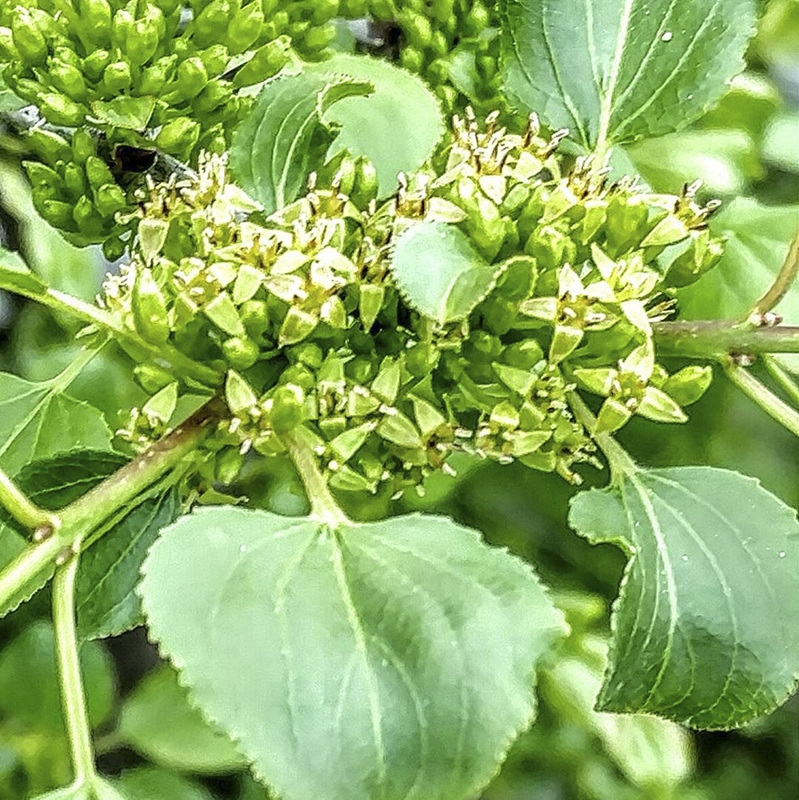 The inflorescence is a stalkless, umbrella-like cluster (umbel) of 1 to 5 flowers rising from the leaf axils of the lower part of current year’s long twigs and from short spur branches. Male and female flowers appear on separate plants. The flowers are about ¼″ wide. They have 4 conspicuous, spreading, yellowish-green sepals and 4 shorter, inconspicuous, erect, green petals. Male flowers have 4 stamens, female flowers have 1 style. Each flower is on a ⅛″ to 5 ⁄16″ long, usually hairless flower stalk. They appear in mid-May to mid-June after the leaves have formed. The fruit is a berry-like, 3 ⁄16″ to 5 ⁄16″ in diameter drupe containing 3 or 4 seeds. It is green at first, eventually turning bluish-black at maturity. It matures in late August to late September and often remains on the twig long into winter. 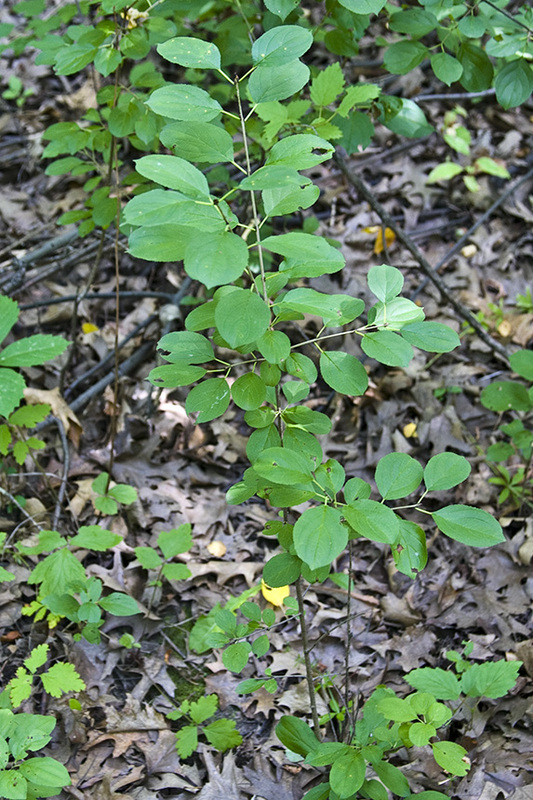 Glossy buckthorn (Frangula alnus) has no thorns. The leaves are always alternate, never opposite or almost opposite. There are 6 to 9 straight, parallel lateral veins on each side that curve up near the margin. The upper surface is glossy. The margins are untoothed. The flowers and fruit are in clusters of up to 8. The fruit falls to the ground before winter. Gray dogwood (Cornus racemosa) has no thorns. The leaves are always opposite, not merely almost opposite. The leaf margins are untoothed. The flowers are white. 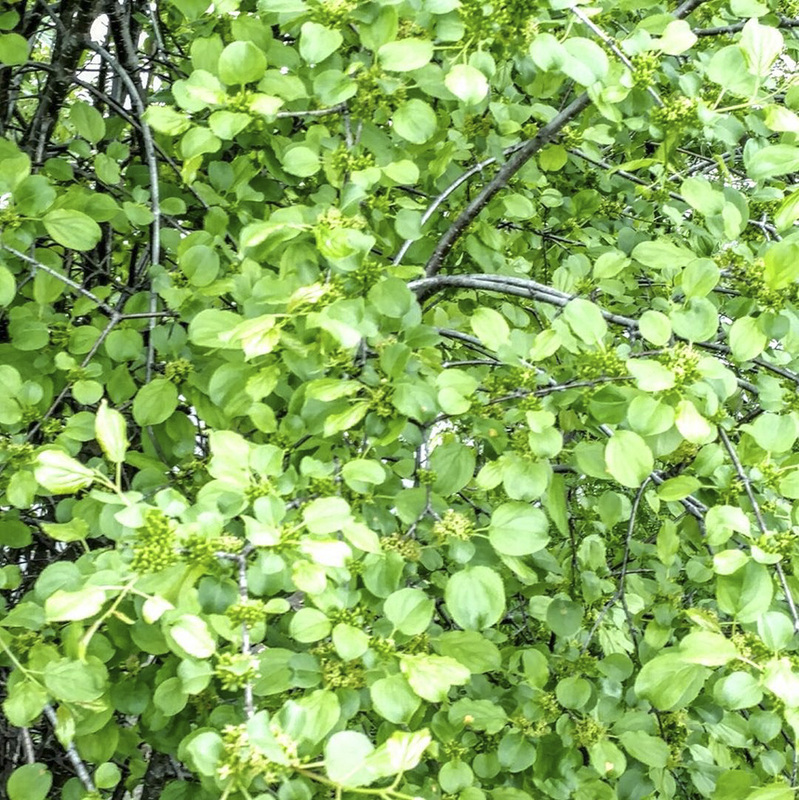 The fruit and flowers are in dense clusters of 20 to 75 at the end of the stems. Alkaline; rich in limestone; containing a high proportion of calcium carbonate. Join Nate the Invasive Species Hunter as he looks for Southern Ontario's highly invasive species. 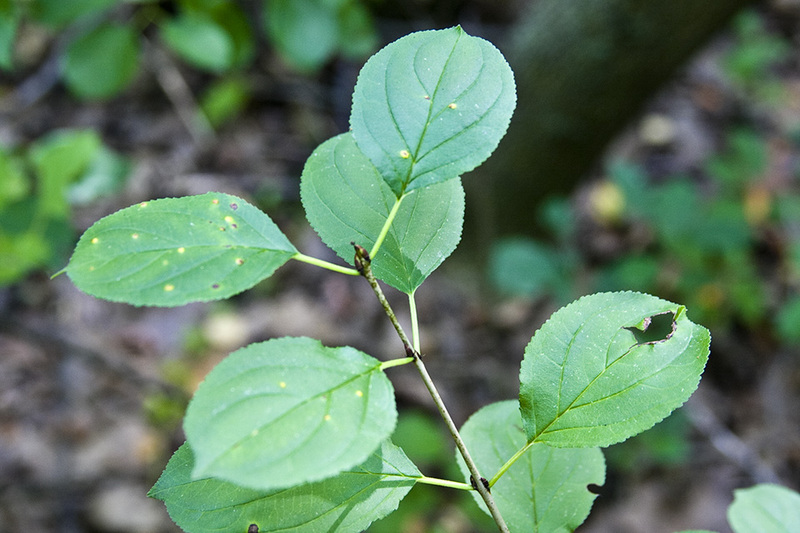 He'll show you how to ID common buckthorn and explain some of the impacts these plants have on our biodiversity. Written and video taped by the Central Lake Ontario Conservation Authority in partnership with the Invading Species Awareness Program and the Ontario Invasive Plant Council. This is a intro to a show we are doing on the invasive Buckthorn tree. 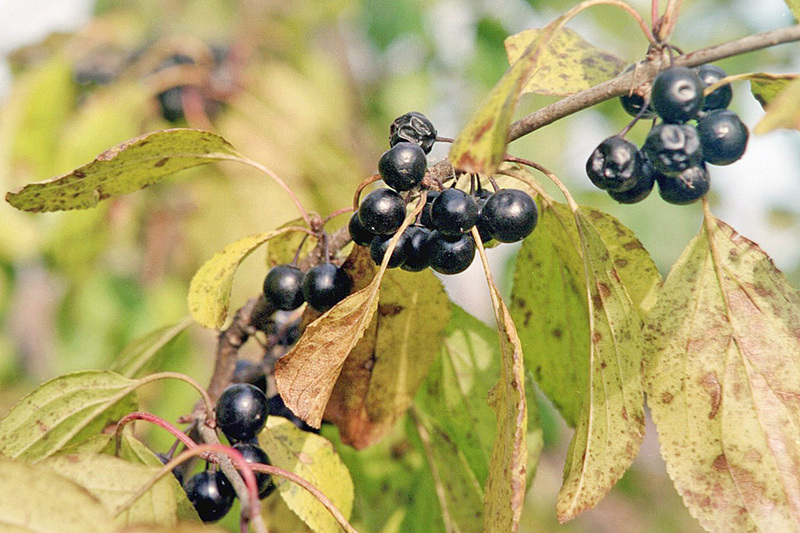 Buckthorn is taking over our forests, woods and even our yards. Stay turned for the whole story. This is a short educational video about how to identify buckthorn in the winter. 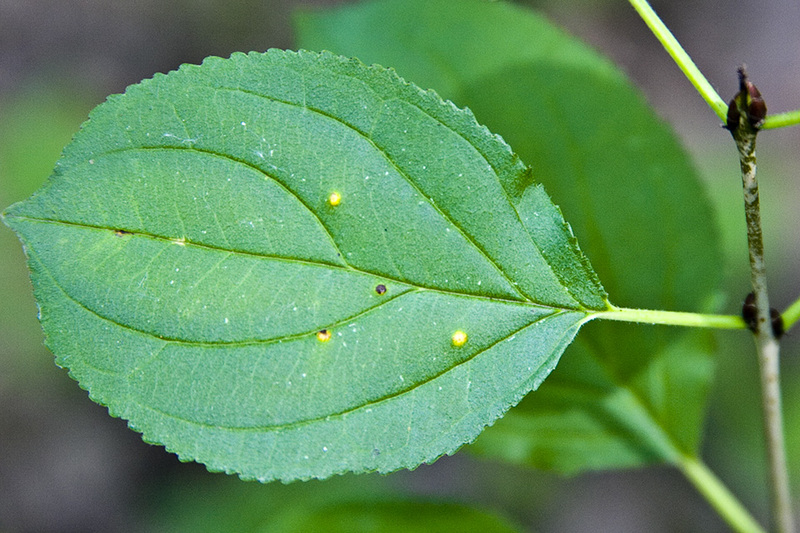 Buckthorn slowly invades the Twin Cities areas, attacking its forests and spreading disease. An invisible massacre.